Americans Against Gun Violence president, Dr. Bill Durston, spoke at the annual August Peace Event in Sacramento, California on Sunday, August 7. The event is held every year to commemorate the atomic bomb attacks on the Japanese cities of Hiroshima and Nagasaki on August 6 and August 9, respectively, in 1945. Dr. Durston was asked to speak at this year’s August Peace Event concerning what actions citizens could take to help ensure that nuclear weapons would ever be used again. 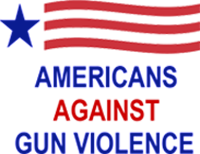 Americans Against Gun Violence was a co-sponsor of the event. "The death toll from small arms dwarfs that of all other weapons systems – and in most years greatly exceeds the toll of the atomic bombs that devastated Hiroshima and Nagasaki. In terms of the carnage they cause, small arms, indeed, could well be described as ‘weapons of mass destruction"
Every year at the August Peace Event, the story of Sadako and the 1,000 Cranes is retold. Sadako was a young Japanese woman who survived the Hiroshima atomic bomb blast in 1945 but who later contracted leukemia, probably due to the radiation to which she was exposed. According to Japanese legend, if one folds 1,000 paper cranes, his or her wish for a long and healthy life will be granted. Sadako succeeded in folding over 1,000 cranes as she battled leukemia, but her wish to live was not granted, and she died 10 months after her leukemia was first diagnosed. Dr. Durston urged attendees at the August Peace Event to help us write a story with a happier ending - The Story of Sacramento and the 1,000 Phone Calls - by calling President Obama and their elected members of Congress to demand that they oppose any further spending on “modernizing” our nuclear arsenal and that they instead work toward the complete abolition of nuclear weapons. At the same time, Dr. Durston urged attendees to demand that the President and members of Congress work toward the adoption of definitive gun control laws in the USA – laws comparable to those already in place in every other high income democratic country of the world. Attendees at the August Peace Event enthusiastically supported Dr. Durston’s call to action, and many volunteered to have their pictures taken “taking a stand against gun violence and nuclear weapons.” Selected photos from the August Peace Event will be used to create the banner on the Americans Against Gun Violence website.